I am a fan of Eric Worre’s & he has great information on network marketing. 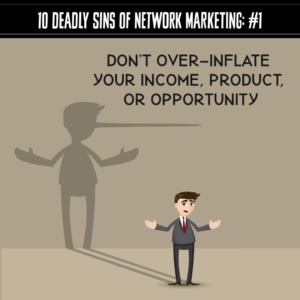 Below is his article on the 10 Deadly sins of network marketing & it is great tips to be aware of. If you want to be a leader in business, there are many traits and habits you need to develop – but there are also many you need to avoid. I’ve come up with the 10 deadly sins of Network Marketing as a road map you can use for yourself and your team. We’ll start with an easy one – don’t lie to people! Maybe you got an awesome check one month, but then your income dropped back down again. Don’t keep telling people that high amount is your monthly income. Maybe you qualified at a certain level in your company and got a pin, but haven’t qualified at that level in years – but you still have the ego about the pin. Here’s the thing…everybody knows when you lie. Everybody knows when you stretch the truth about your income. Everybody knows when you’re dishonest about your rank. You’re not fooling anyone. You’re just damaging people’s ability to trust you. There’s a difference between being strong and being rude; between being an influencer and being a tyrant. There are a lot of bullies in Network Marketing. That behavior stems from insecurity, inadequacy, or ego. You don’t want to make people dread being around you. Tearing people down isn’t an effective way to lead or to create growth. Bullying is destructive to others and to your own reputation and influence. If you feel like treating people that way, take a minute to find a better way. We are naturally drawn to positive people and repelled from negative people. Think of a toxic person in your life. Do you love spending time with them? Do you feel like that adds to or takes away from you? Make sure you aren’t that toxic person for others. But what if things ARE negative? There’s a really incredible technique you can implement called reframing. It involves shifting the way you think about negative experiences and difficulties. When you learn to reframe situations in a more hopeful light, you can pass that positivity on to others. This is the thief of your growth. The biggest challenge I had for my entire career was inconsistency. I’d be white-hot and going crazy after an event like Go Pro Recruiting Mastery, but then I’d fizzle out within a few months. I was back and forth, and my team lost faith in me. Let me recommend that you divide your days into three categories. A productive day is one where you’re really grinding. A support day doesn’t necessarily involve things like recruiting, but you’re supporting your team and generally moving things along. A lost day is a day where you didn’t move your business forward at all. If you’re honest, in the last 365 days how many lost days did you have? That’s where inconsistency shows up. You need a baseline of activity every day. If you’re in the habit of spending more than you make, your income doesn’t matter – you will always be struggling. Worse, it puts you in a desperate situation where you might be tempted to compromise your ideals and your time. Learn how to manage money well, even if you don’t have as much of it to manage as you’d like right now. Then when you do have more to work with, maintain some self-control and keep making calculated decisions about what to spend your money on. All the money in the world won’t make you rich if you spend more than you make. Be honest…have you ever poached someone else’s prospect? Here’s the rule for Network Marketing: Never take a person that’s happy with another company and do anything to make them unhappy. Don’t even plant a seed of doubt or talk negatively about their company. Yes…that IS what I mean. Company events are a great way to meet new people – but they are certainly not a place for sleeping around. Maybe your home life is rough, or maybe you don’t have a significant other waiting for you back home. Doesn’t matter! It will damage your reputation and hurt your business. I understand that people have challenges. Addictions take many forms, and I have compassion (not judgement) for people who struggle with them. But the thing is, if you wouldn’t get drunk at 2pm on a Wednesday at the home office, you probably shouldn’t do it at a convention. Know your struggles and be careful not to bring them into your business. I understand that some of you are amazing. It’s hard not to take the stage, because you can really kill it! But when you demand all the stage, you create resentment within your organization. You have to look into your team to find somebody who can be an influencer and give them some sunlight. Temper your own ego by building your team’s capacity. Let’s say you’re making $100,000 a year. Maybe you have the ability to be making $1,000,000 a year, but you’re good with $100,000. Is it okay to stay at that level? In my opinion, you can if you want to – but it’s selfish. Your paycheck is a reflection of how many people you’re helping and how many lives you’re touching. Shift your focus to the success of others. Now, I’ll be honest. I haven’t committed all of them, but I have committed most of the 10 deadly sins of Network Marketing. So where do you go from there? What do you do when you’ve crossed the line? 1️⃣ Be smart enough to step back. It’s not enough to say you’re sorry, and it’s unreasonable to expect everything to be back to 100% right after you do. It may take time to repair the damage that your decisions caused, and you need to accept that. You can move forward in a positive direction and make your ability to lead stronger than ever before – but it’s not going to happen right away. You have to stop doing the destructive things and focus on rebuilding and repairing the damage.